Travis McGee was introduced to me in 1964 by my father, who was visiting me in Florida. He was reading "Nightmare In Pink", and had just finished"The Deep Blue Good-by", which he gave to me. Both books were written by John D. MacDonald . That is not Travis in the photo above. 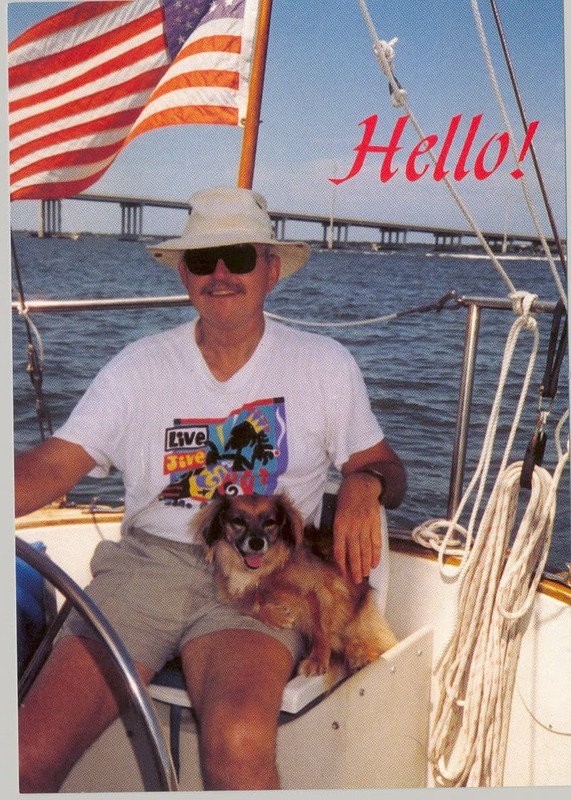 It's me and my dog Sugar on my sailboat, Silverheels, in 1997. I've always identified with Travis and you will too when you get to know him. I have now been a Travis and John D. MacDonald fan for more than 50 years. I have read all 21 of the McGee novels at least twice, some more. Travis became my alter ego. Travis McGee is different than most other "detectives" you encounter in mysteries and crime fiction. He is not a policeman or a licensed private investigator. Instead, he describes himself as a salvage consultant. He recovers property that has been stolen, swindled, or otherwise misappropriated from his clients. He charges a fee for this service. Travis lives on a 52 foot houseboat named "The Busted Flush". The name comes from a poker game in which Travis won the boat from an unfortunate millionaire who only had four of the requisite five cards and tried to bluff Travis. The "Flush" is berthed at Slip F-18, Bahia Mar Marina, Fort Lauderdale . In 1987 a plaque was erected at the marina that memorialized the slip and its famous resident. The plaque was removed some years ago by new owners that didn't appreciate the literary landmark. Travis calls himself a beach bum who takes his retirement in installments. He prefers to take on new cases only when the cash fund hidden in a hidey hole in the Flush gets low. He also owns an old Rolls Royce that somebody long ago converted into a pick-up truck. The truck is painted a horrible blue by the guy who did the conversion. Travis McGee calls this vehicle "Miss Agnes" after his grade school teacher who had hair the same color. Most of Travis's salvage consulting business is from word of mouth by satisfied clients. His clients have usually had something stolen or swindled from them, usually by unethical and often legal means. They have no legal way to get it back. This is where Travis comes in. His usual fee is half of whatever he recovers, plus expenses. If the prospective client gripes about this being too high, Travis always reminds them that half of something is better than nothing at all. In many of his cases, Travis takes revenge on the guilty parties. He is physically equipped to do so. Travis McGee is about 6 foot 4, and packs 205 lean muscular pounds on his long lanky frame. He has a perpetual deepwater suntan. He is a veteran of the Korean War, and was a star tight end on his college football team. He went on to play pro football for a few years until a knee injury forced him into early retirement. He's much stronger than he looks, and observant thugs thinking of fighting with him often notice that he has exceptionally thick wrists and long arms. The smart ones back off or figure out a way to hurt him without getting too close. Travis has a 33 inch waist, and wears a 46 long sport jacket, and wears a 17 1/2 by 34 shirt. He stays in shape by swimming against the current in the Fort Lauderdale ocean and running on the beach across the street from Bahia Mar. He is not above admiring the bikini clad sandy bottomed beach bunnies he sees along the way. Travis is popular with women, and has bedded a few dozen lovely ladies during his 21 novel lifetime. If he falls in love, the poor gal usually gets killed or goes back home after Travis's special therapy. Travis never loses his senses of honor, obligation, and indignation. He always treats women with respect. Travis was one of Florida's earliest environmentalists, voicing his author's concern about what was happening to the state by unbridled development. His best friend is Meyer, a world renowned economist who lives on his cabin cruiser, "John Maynard Keynes", at Bahia Mar. Meyer is a gentle stocky hairy bear of a man. The "Keynes" gets blown up in one of Travis's adventures and Meyer gets a new one named "Thorstein Veblen" and moves aboard. We don't know if Meyer is a first or last name, although some people call him Dr. Meyer. My guess is that it's his last name. Meyer's boats are loaded with books, not just on economics but in many areas of his expertise. He is a chess master and an amateur psychologist. Meyer is not only Travis's best friend, he is his sounding board for ideas and his walking encyclopedia. Meyer also likes the beach, and the beach bunnies find him fascinating. He has a habit now and then of bringing a gaggle of these beautiful little gigglers back to the marina for a drink or two. He also sometimes helps Travis scam the scammers. Travis McGee may be the first great modern fictional Florida hero. He was the prototype for characters created by Florida authors like Elmore Leonard, Carl Hiaasen, Tim Dorsey, James W. Hall, Les Standiford and Randy Wayne White. The Library of Congress's "Center for the Book" commissioned a short work by MacDonald, an essay entitled "Reading for Survival". The essay takes the form of a dialogue between Travis McGee and Meyer on the importance of reading to the survival of the human species. The 26-page essay was released in a limited edition of 5,000 copies and was available for a small contribution to the Center for the Book. I am lucky enough to have a copy. Each of the 21 Travis McGee novels has a color in its title. John D. MacDonald died in 1986, and later that same year my father spent his last night in a nursing home in St. Cloud, Florida. He was heavily medicated for pain and quite confused. His last words to my mother shortly before he died were for me. He told her to tell me "Nightmare In Pink". He said I would understand. I did. And if you read "Nightmare In Pink", you will too. All 21 of the novels are available at Amazon. I believe everything MacDonald wrote is still in print. Although John D. MacDonald died in 1986, there is a wealth of information about him and Travis in libraries and on the internet. I have selected a few just to illustrate the lasting appeal of the author and his creations. Who Is McGee? - This fellow does a very good job of capturing the essence of Travis. Homage To McGee - This is a tribute by a very articulate man, Doug Johnson. You will learn more about Travis here. McGee's Little Black Book - We all know Travis bedded down quite a few lovely ladies in his career. This thoughtful author has come up with a list of names. McGee Fan Page - This page was created by S. Rufener and has a wealth of information including story lines for all 21 novels. The Trap of Solid Gold - This is a blog created and maintained by Steve Scott. He does a wonderful job celebrating the work and life of John D. MacDonald.